Every smartphone user wants to prove smart and imagine how an Apple iPhone user would feel. To download ringtone iPhone would become their priority. But unlike Android phones, iPhone does not allow this process to happen quickly. Then people start looking at iTunes as an alternative. However, it feels humiliating to follow the cumbersome process. On the other hand, you cancustom iPhone ringtone from iTunes. Still, you feel concerned for making a payment for a ringtone. Now, you can relax and understand that you will get them for free and can quickly download them to iPhone. Of course, you can easily purchase and download ringtones on iPhone, but it’s not necessary because you can customize your own tones from any songs you like. Besides, you can also share the custom ringtones with friends. So how you can easily make it? 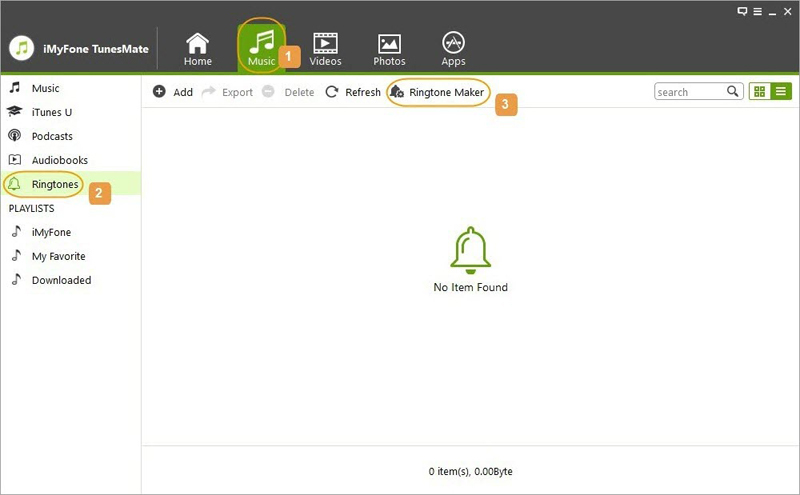 Taking advantages of iMyFone TunesMate iPhone Manager, you manage your iPhone ringtones as you wish, which could not be realized by iTunes. 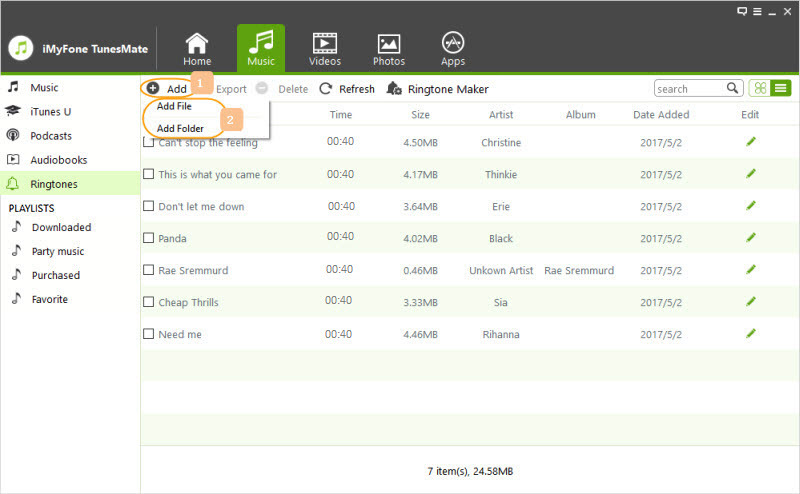 Except to make ringtones, TunesMate helps to transfer music, videos, photos, files, etc. freely between iPhone and computer. You can start and stop the song as make that portion as your ringtone. Either a song from a computer or iPhone can be made to be your ringtone. You can preview the tone and save it to computer or directly to iPhone. Sync iTunes/computer tones to iPhone without deleting existing data. Extract your purchased or custom ringtones from iPhone and share with friends. If the ringtones are already on your computer, you can directly download them to your iPhone without hassle. Step 1: Connect your iPhone to computer and open iMyFone TunesMate. Step 2: Go to “Music > Ringtones”. Click on “Add > Add File” and select the tones from your computer. 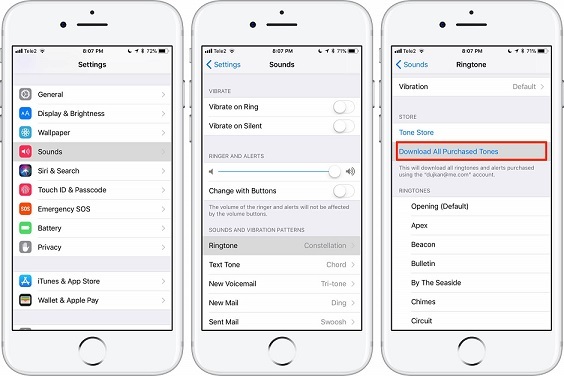 It will help you to download ringtones from computer local folder to your iPhone. Step 1: The same as the above, connect your iPhone to iMyFone TunesMate iPhone Manager. Step 2: Go to “Music > Ringtones > Ringtone Maker”. Select a song from by using “Local Music” or “Device Music”. Choose “Local Music” to select a song from your computer. Choose “Device Music” to choose a song from your iPhone. Step 3: TunesMate will start playing the song. Select the portion you want with a start and stop option. 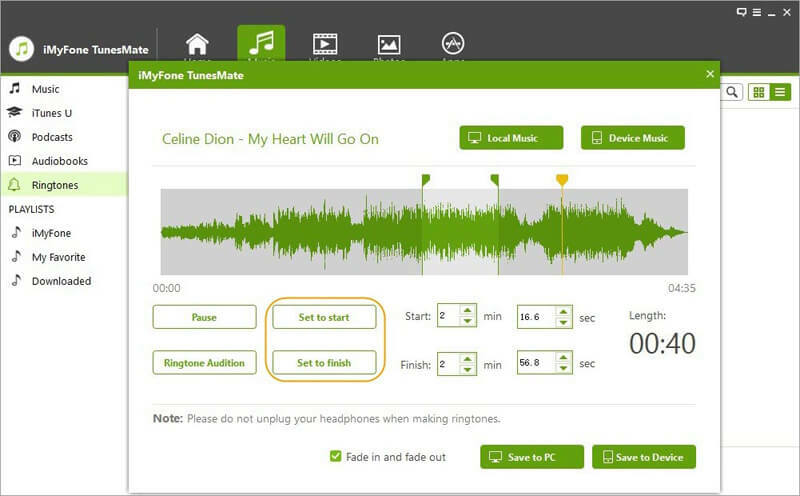 Step 4: You can use the Ringtone Audition to preview the ringtone. You can download the ringtones to your PC or your iPhone. Note: “Fade in and fade out” will be checked by default to make the ringtone sound smoothly. If you don’t want, just uncheck it before you save it. To get the best ringtone not just from music library but the websites, then you must know the sites offering them. You can now get ios ringtone download for free and additionally remember to check the legality. Now you want to know the sites that offer legal ringtones for free? Find the top five sites providing ringtones for free and assuring the legitimacy. Once you download the free ringtones to your computer from these sites, you can use TunesMate to move them to your iPhone. One thing on top of your mind remains how to download ringtones on iPhone for free another side of the purchasing ringtones. Step 1: On your iPhone, open Settings app. Step 2: Go to "Sounds" or "Sounds & Haptics". Step 3: You would find different ringtones under the "SOUNDS AND VIBRATION PATTERNS". Click any of the tab like "Ringtones". Step 4: Click "Download All Purchased Tones" and all your previously-purchased tones will be downloaded to your iPhone. Now quickly set the downloaded song by Default Ringtone and receive all calls with your preferred ringtone. Setting downloaded ringtone as Default Text Tone will become your message tone. Individually, assign a ringtone to contacts and with that song you can make out the caller. After making all selection, you must wait to let the download complete. Then you will witness the song appearing on your device "Ringtone" list. iPhone 6/7/8/X Ringtone not Working on iOS 12/11? Fix it Here!